Timu Gallien’s research examines evolving coastal hazards from climate change and urbanization using numerical modeling and high resolution field observations. Her research interests include urban coastal flood prediction, beach groundwater, coastal infrastructure, and nearshore processes. Gallien received her Ph.D. from UC Irvine. 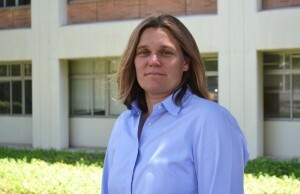 Before joining UCLA, she was a Chancellor’s Post-Doctoral Scholar at Scripps Institution of Oceanography, UC San Diego. Schubert, J.E., Gallien, T.W., Shakeri Majd, M., Sanders, B.F., 2015. Terrestrial laser scanning of anthropogenic beach berm erosion and overtopping. Journal of Coastal Research 31, 47-60. Gallien, T.W., Sanders, B.F., Flick, R.E., 2014. Urban coastal flood prediction: integrating wave overtopping, flood defenses and drainage. Coastal Engineering 91, 18-28. Gallien, T.W., Barnard, P.L., van Ormondt, M., Foxgrover, A.C., Sanders, B.F., 2013. A Parcel-Scale Coastal Flood Forecasting Prototype for a Southern California Urbanized Embayment. Journal of Coastal Research 29(3), 642-656. Gallien, T.W., Schubert, J.E., Sanders, B.F., 2011. Predicting tidal flooding of urbanized embayments: A modeling framework and data requirements. Coastal Engineering 58, 567-577. Harmeyer, K.J., Holland, M.A., Gallien, T.W., Lumkes, J.H., Krutz, G.W., 2009. Embedded Sensors in Rubber and Other Polymer Components. Strain 45(6) 543-546. C&EE 151 – Introduction to Water Resources Engineering. : Principles of hydraulics, flow of water in open channels and pressure conduits, reservoirs and dams, hydraulic machinery, hydroelectric power. Introduction to system analysis and design applied to water resources engineering. C&EE 157A – Hydrologic Modeling: Introduction to hydrologic modeling. Topics selected from areas of (1) open-channel flow, including one-dimensional steady flow and unsteady flow, (2) pipe flow and water distribution systems, (3) rainfall-runoff modeling, and (4) groundwater flow and contaminant transport modeling, with focus on use of industry and/or research standard models with locally relevant applications. C&EE 298 – Coastal Process Modeling : The course introduces coastal process theory and modeling. Students will learn to acquire coastal topographic and hydrodynamic (e.g., waves, water levels, stream flows, precipitation) data to model coastal and estuarine environments. Empirical and analytically derived coastal process models will be presented and used to estimate coastal events. Canonical nearshore literature will be analyzed and various coastal process models will be reviewed. Typical field instrumentation (pressure sensors, ADCP, CTD, survey) and resulting data will be discussed and analyzed. Students will build a model relevant to their research from start to finish by synthesizing data from publically available resources (e.g., NOAA Digital Coast, MesoWest, USGS, CDIP) to predict a future coastal event.